﻿ 4 Ways to Make your Mark in B2B eCommerce: Are you ready for the next big thing? The eCommerce industry is booming! When people think about eCommerce, they tend to just think about the B2C sector and how the retail industry is affected by this digitalization. But eCommerce is not just for B2C; the B2B eCommerce is the latest trend. Supply chains in distribution are especially affected, but many wholesale industry representatives still hesitate to embrace eCommerce and risk losing touch with industry changes. By not adapting to new trends, two risks arise simultaneously: a company’s inventory management processes might no longer be competitive, and competing wholesalers could offer more product diversity at lower prices due to cost savings from optimization. Secondly, with the rise of B2B eCommerce, the rest of a distributor’s supply chain is probably already aligned with eCommerce. If suppliers and customers are adjusted to align with eCommerce requirements (while the distributor doesn’t embrace eCommerce), it’s possible that a distributor will lose partners, suppliers, and customers. What can you do for your supply chain to get started in B2B eCommerce? To remain competitive, foresight is needed to explore new markets and procure inventory under the best possible conditions. Using eCommerce to penetrate new markets is easier than attempting local sales. On the flip side, eCommerce is useful in procurement as suppliers are increasing their online sales as well, allowing distributors to take advantage of attractive prices and easily available products. With eCommerce, a global supply chain can be established while maintaining low operative costs. The effects of this growth in logistics and inventory management are enormous. The larger the portfolio of suppliers and the more extensive the supply chains, the more difficult it is to manage them adequately. While it’s possible to manually compare prices for a few suppliers, this is no longer economically viable with a large network of suppliers. To get a strong foothold in eCommerce, distributors need to decide invest in advanced software that automatically compares prices and even automatically initiates orders. B2C eCommerce customers are already used to intuitive user interfaces or online shops for processing their purchases, but many players in the eCommerce wholesale sector are still lagging behind and some suppliers rely on outdated interfaces – or don’t have one at all. But intuitive and user-friendly interfaces are important to potential customers in wholesale and are often a deciding factor. Customer satisfaction and customer relationship management are the key buzzwords here. Not only do eCommerce companies need an attractive online presence, but they need to retain customers by processing orders quickly, efficiently, and correctly. This requires optimized inventory processes; for starters, the inventory quantity displayed in the online shop needs to be identical to the actual stock. This creates a need for inventory systems that work in real time. Cancelled orders, returns or reservations also need to have a “live” impact on the inventory levels. Making sure that the right warehouse has the right amount of the right products when they’re needed requires a complete and continuous overview of your inventory. Additionally, eCommerce customers are very price-sensitive. Therefore additional expenses such as express delivery have to be minimized since these costs cannot simply be passed on to the customer – so these end up reducing to your own profits. Order processing should be handled with as many orders as possible together all at once to minimize additional costs. As previously mentioned, customer loyalty depends on excellent customer service and a delivery reliability of close to 100%. But your own delivery reliability depends on your suppliers and your relationship with them. From the suppliers’ point of view, customers that plan in the mid- or long-term are particularly welcome. Such planning makes it possible to acquire the needed items in a timely manner, and the required storage area in the warehouses can be accounted for. This results in consistently punctual and correct deliveries to your warehouse due to extensive planning and avoids the errors and detrimental effects on product quality that result from time constraints. How can this be accomplished? Through accurate forecasting and the analysis of demand trends so you can plan and place your orders with your suppliers. Modern software can provide these tools and ensure a win-win-situation for both partners and the respective warehouse locations. A final factor to consider in comparison with traditional wholesale: eCommerce is much more unpredictable. For example, if one of your competitors simply adjusts the price of one of their products in the system, it’s instantly visible to all potential online customers. If you had a high demand for the same product – and used that high demand to base your ordering behavior and the respective inventory levels on – it can now change dramatically! The price you are offering suddenly becomes the higher price, and a substantial number of your customers will be ordering from the competition. A product portfolio of hundreds or thousands of articles makes it impossible to manually compare your prices with those of the competition on a regular basis. Consequently, a resulting change in demand has to be recognized and reported automatically. You can then decide whether you want to sell the stored articles for lower prices and/or whether future orders with your supplier need to be adjusted in order to guarantee a healthy inventory level. Accurate demand forecasting is a must to quickly and automatically replenish inventory in a fast-paced eCommerce environment. 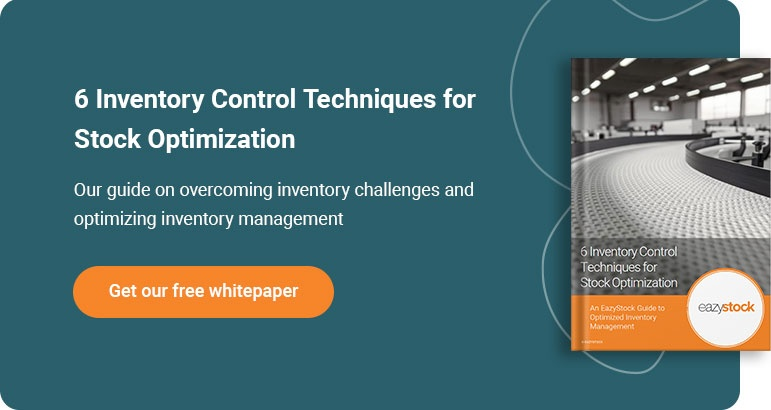 Inventory management and inventory optimization have to continuously work and adapt in real time to guarantee perfect visibility into inventory. The risk of excess inventory due to the expanding product portfolio and high service level goal grows considerably; it’s important to optimize your inventory to have the lowest possible levels with the highest possible service levels. Keeping these best practices in mind from the start already sets you on the path to success, but these best practices can only be implemented by relying on modern and sophisticated software for support. At EazyStock we’ve focused on inventory optimization for years and have developed the right tools for your business to help you succeed in B2B eCommerce.